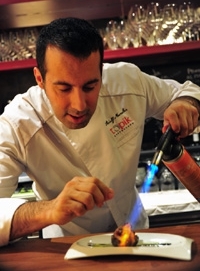 The culinary adventure of Adelf Morales began during his childhood, when he discovered, thanks to family travel, the kitchens of Arzak, Casa Nicolasa, Casa Botín o Jockey in Madrid. «Locals where the cuisine of my country has been born», reflects the chef of the Topik. Adelf explains that when he had to decide what he wanted to be,thanks to his concerns and preferences, his steps went to the Escuela de Hostelería de Barcelona (ESHOB). «I preferred a job that did it not bore me and the kitchen is unlimited, You never know enough, it gives you good and bad moments and it is very grateful». 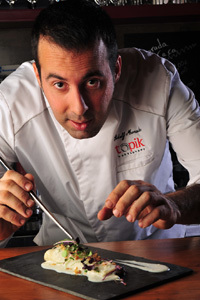 He worked as a chef in Martín Berasategui in Lasarte; Bodegón de Alejandro, in San Sebastián; Ca´Sento, in Valencia, Ca l’Isidre, in Barcelona, and Arzak in San Sebastián before packing and heading to Italy to work in Antica Osteria del Ponte, in Milán, Pierino Penati, in Leco, and later as a head chef in the Casino de San Remo. This Italian trip allowed him to delve deeper into what Adelf is the essence of cooking: the product: «I peeled partridges, I worked the white truffle, I learned the process of a well-made meat juice…». When he returned to Barcelona,​he decided to take the leap to Japan, where he spent three years traveling and learning. «I was fascinated and I still do by Japanese cuisine because of their veneration towards the product. I was eating in izakayas (taverns), in restaurants of traditional cuisine in Osaka… The only thing in wich I always have invested is in traveling and going to eat at different places to learn from Japan. It’s another world». On his return and after being part of several gastronomic projects, he opened in 2009 the restaurant Topik with his wife, the interior decorator Eva Mele. 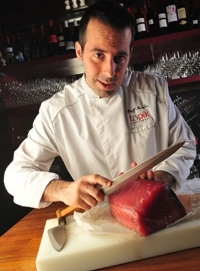 Adelf Morales, who conceives his cuisine as an experiential experience, has an obsession: the respect for the product. Everything in his cuisine revolves around this concept so simple and necessary. “The best is the less you touch the product”. 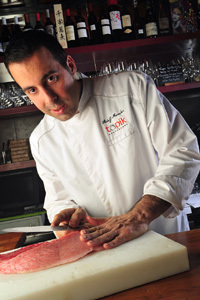 That is the essence of his cuisine, which we summarize in 7 ideas that reflect Topik’s philosophy. 1-Cuisine: “The cuisine is an experiental experience”. I always try to recreate my experiences on the plates I cook. The product it’s the base of everything on my cuisine. «La cocina es un conjunto de vivencias. Siempre intento recrear mis experiencias a partir del producto, que es la base de todo. As much as you respect the product it will be the best . I never forget the tradition wich it is essential to understand the cuisine. 2-Memory: I could remember when I went to Arzak when I was a child and they have not an special menu for kids and they prepared me an Scorpion fish pudding. I was so surprised !!!!!. I will never forget the baby cuttle fish, the desserts or the rice with milk I eat in Casa Nicolasa. They are always in my mind. 3-Aromas and flavors: I’m fascinated with the sweety aromas of japanese cuisine. I could remember my promenades in Japan where all the restaurant uses the robata to cook and I can not forget that aroma of grilled mixture with leftover soy sauce on the gril, it’s an aroma between burned and caramelized. Or a fish broth or shellfish or a pella smelling. All of them are clean and refined aromas. 4-Ingredients: Soy sauce, sake and rice. I can not imagine my life without rice. 6-Creative process: The most important it’s the producct. Afterwardsm I always try to be consistent and respect the taste. It’s my way to understand the cuisine. 7-Hobbys: My family, travel, a good wine, tasting new dishes and learning new things.